This page is to serve as a general guideline for addressing filter problems, whether it's a leaking filter, a filter that was damaged in shipping, a wrong model of filter that was shipped to you, etc. If, for whatever reason, you received a different model or configuration of water filter or other product offered by ESD, please get in touch with us immediately. If the error was that you mistakenly entered the wrong model number on your order, we'll work with you to get what you meant to order to you with the least amount of hassle and expense. If it was the manufacturer's shipping error and you were sent something other than what you ordered, we'll have that manufacturer issue a "call tag" to pay for the return of the wrong filter at the time carrier (either UPS or FedEx) delivers the correct filter. It's a pre-paid shipping lable, so all you need to do is hand over the re-boxed filter (tape it up good, please) and off it goes. You won't be out anything other than the inconvenience of the delay to get it right. It's a rare thing, but we're here to straighten out any sort of tangle like that. Like the ambiguous term "water filter" (that can be a dozen different types of filter), a "leaking" water filter may or may not be leaking from the water filter. Honestly, that's not said to be intentionally confusing. We regularly encounter filters returned to the manufacturer for "leaking" only to discover that it wasn't the filter that was leaking at all, it was the connection between the water line and the fitting on the water filter. A filter that is reported to be leaking and returned to the manufacturer will be bench tested. This is done by applying a high pressure air hose to the filter -- MUCH higher pressure than your household water pressure puts on the filter. The filter is submerged in a lab sink of water and the air is pumped into the filter inlet fitting with the outlet fitting plugged. If there's a leak in the filter itself, it'll shoot a stream of air bubbles out the point where the leak would occur. But, with approximately 20-30% of filters returned for leaking, the filter is found to be solid. No leaks evidenced by the pressure test. Which leaves only the conclusion that the leak the customer was seeing was happening at the connection of either the inlet or outlet water line. And in truth, that's the most likely suspect. In short, it pays to be sure that the leak is coming from the filter and not the connection or somewhere else before you send it in for inspection and warranty claim. It can sometimes be a little tricky to tell. If you're not really sure where the leak is coming from, it might even be a savings to hire a plumber or handyman to check it out. If it's a leaky connection, that's an easy fix and whatever you pay that plumber/handyman for stopping the leak would surely cost less than shipping a perfectly good filter back and forth to/from the manufacturer. That's said in the spirit of trying to help you rectify the problem in the most economic and hassle-free way, not to try and dodge our responsibility to you for top-notch customer service. If the filter itself has actually sprung a leak, and if it's still under warranty, we'll do everything in our power to do you right. First -- Is your filter equipped with the metallic, threaded compression fittings or with the white plastic "quick connect" fittings? Nearly all (unless by special request) of the filters sold by ESD employ the metallic threaded compression fittings. We believe they are more dependable over the long haul, and they are far less prone to getting damaged in shipping. Disconnect the water line from the filter and use enough teflon thread tape to give the threads on the filter's fitting two (and only 2) wraps. Remount the water line being sure to not OVER-tighten it. The best way we know how to describe "tight enough" is to say: Hand tight (screw it on as tight as you can by hand), and then another 1/4 turn tighter with an open-end wrench on the hex head nut. Turn the water back on to the filter and see if you have stopped the leak. Watch it for at least a minute to see if it develops a drip or even a hanging drop. If it does, give it another 1/4 turn. Worst thing for threaded compression fittings is to "go gorilla" and over-tighten the fitting. Check to be sure that the leak isn't coming from somewhere above and running down the outside of the water line until it comes to the fitting, giving the false impression that the filter is leaking at the fitting (you wouldn't be the first to discover this bit of treachery). 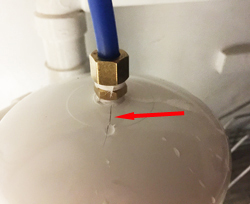 If the cause of the leak is something glaringly obvious, like a crack in the dome of the filter or water bubbling up at a seam -- either where the body of the filter is welded to the domed cap or where the body is welded to the base -- the best thing to do is to snap a picture of it and send it to us. Knowing up front and with certainty what we're dealing with will help us speed along the process of getting your filter replaced by the manufacturer. Here's an excellent example of that as submitted by a recent customer. This turned out to be due to rough handling by the carrier (shipping damage). Check the warranty card that came with your original purchase of the water filter. Different models of filters can have different warranty periods. Do note that the warranty is prorated, meaning that the dollar figure listed as warranty value for your model of filter is the amount your water filter will be reduced in value for each month of good service you got from it. Note also that the warranty period begins on the date of purchase, not the date of installation. If you buy a water filter and decide to not install it for two years, and then discover that it is defective or was damaged in shipping, you very likely will discover that the warranty value has been reduced to zero. Installed immediately upon receipt or otherwise, please know that the manufacturer's warranty will deal only with the purchase date. Lastly, please always get in touch with us before sending a filter back to the manufacturer for any reason. If we can't help you fix it, we at least need to notify the manufacturer that it is on its way to them. We hope these guidelines and tips will prove helpful to you should you meet the unfortunate need to service or return your water filter for replacement. If you should have any questions about filter maintenance or warranty returns, please don't hesitate to contact us by the contact info below or by our handy-dandy feedback form. The best solution for you is always that we can work with you to affect a fix for the problem. That costs nothing and it's always far less of a headache for you. But if it comes to returning the filter for warranty claim and you need help finding the closest drop-off facility for the carrier of your choice (USPS, UPS, DHL or FedEx), we recommend you visit ShipDig to check out their extensive database directory.